Eco Modern Flats is a sustainable modern design renovation of an existing 96 unit apartment complex. 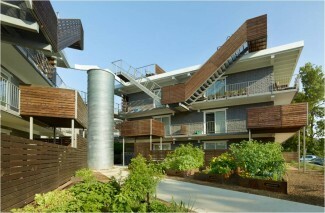 This project is the first LEED for Homes Multifamily Platinum project in the state of Arkansas. This project rediscovers spaces in a palette of steel and cedar to breathe new life into an otherwise banal, layered construction system. The four existing apartment buildings, constructed between 1968-1972, have great bones of precast concrete and split face block but were drastically lacking in thermal, environmental, and aesthetic qualities. The entire complex’s visual presence has been transformed. The stasis of the existing apartment units and the disconnect of the buildings from the inherent site amenities required architecture that performs tectonically and compositionally. By creating elegant armatures combining smart and low-tech sustainable design solutions we overhauled the living systems of each unit and heightened the livable experience. The existing topography and forgotten residual spaces between the buildings have were optimized into various courtyard spaces as well as public and private terraces, patios, and rooftop decks. Each of these spaces are delineated by a kit-of-parts panel system combining the modern durability of steel with the natural warmth of cedar. The interiors were refined as blank canvases upon which people can insert their lives within the efficient 600 SF one bedroom apartments. Quality millwork, concrete countertops and polished concrete floors provide durable, clean, and sustainable finishes complimenting a thoughtfully fresh color palette. A central multivalent wall articulates space while simultaneously serving the kitchen, living and bedroom spaces with storage, light and a 180° rotating TV module.